The theme of the 2010 Shanghai World Expo is “Better City, Better Life”, with a subtheme of “A Blending of diverse cultures in the city; economic prosperity in the city; innovation of science and technology in the city; remodeling of urban communities in the city; interactions between urban and rural areas”. The China Pavilion is themed “Chinese Wisdom on Urban Development”. To echo the themes of the World Expo and China Pavilion, the Hebei Pavilion showcases its local culture and the influence of its adjacency to Beijing to promote urban development and home building. 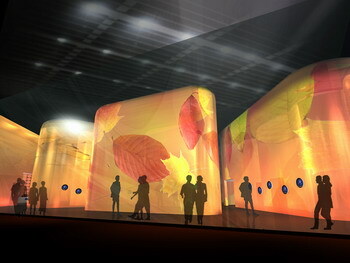 Visual image of the Hebei Pavilion for the 2010 Shanghai World Expo. About 70 million visitors, including 7 million foreign visitors, are expected to attend the 2010 Shanghai World Expo. It is predicted that each visitor will spend no more than eight minutes at each pavilion. To impress visitors in such a short time, the 600-square-meter Hebei Pavilion must have an innovative, but simple design. Hebei Pavilion is themed: “Charming Hebei, Capital Beijing’s Garden”. Hebei province geologically surrounds Beijing, the capital of China since the Yuan Dynasty, so the rise of the former’s cities is closely related to the latter. As a door to Beijing, the province’s cities are influenced by the capital in politics, economics, technology and information. Hebei also borders the Bohai Sea and is a major player in the Bohai Economic Rim that includes Beijing and Tianjin. The region is emerging as China’s third economic growth pole after the Pearl Delta and the Yangtze River Delta. The rise of the Bohai Economic Rim and the integration of Beijing, Tianjin and Hebei are powering the development of towns and cities in Hebei. Hebei’s charming culture, featured by “Simplicity, Blending, and Striving”, has being developing while blending with the cultures of Beijing and Tianjin. The design philosophy of the Hebei Pavilion values a combination of Hebei’s past, today and the future. The pavilion is designed to embody Hebei’s culture and its expertise on urban development.